From brush in hand to brush in machine. left: (Download ) Brush mounted on drawing arm executing a brush stroke. HI DMP, plotter (pen stalls were removed for paint brush routine). right: (Untitled # 81) Algorithmic pen and brush strokes. 18" by 24". HI DMP52 multi-pen plotter, 14 pen stalls. Artist software. This page illustrates two features present in the transition from painting by hand to painting with code. There are other phases of both my early and later work that do not share this kind of relationship. 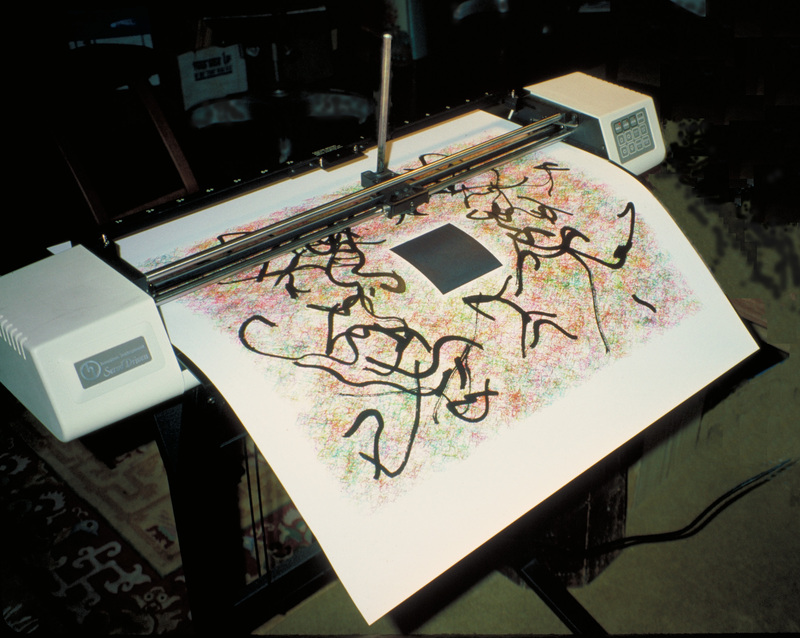 The painting above was executed with ink pens and a Chinese brush adapted to the drawing arm of a pen plotter. 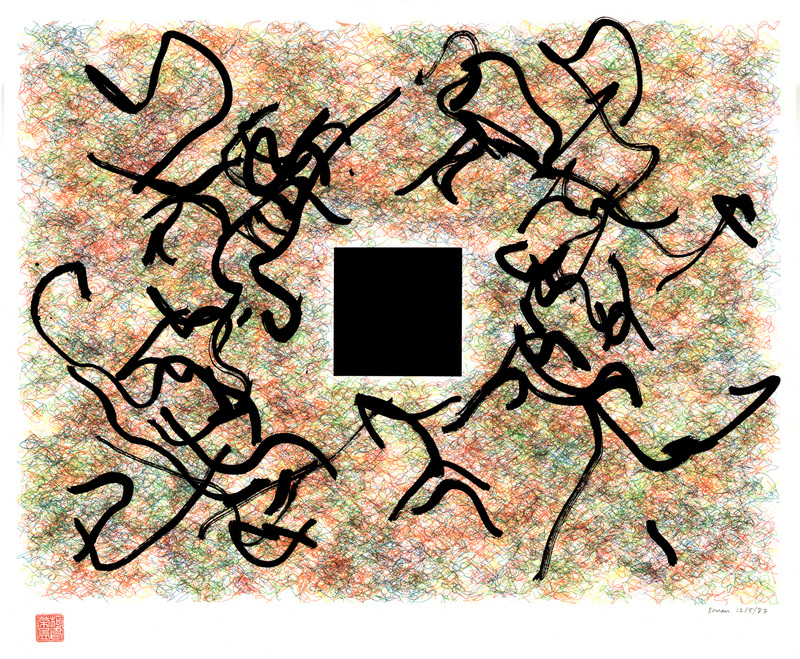 This is the first code driven painting with brush strokes that I documented. Executed in 1987 it represents my efforts to bring both spontaneous and carefully arranged visual elements into the same painting field. The illustrations below show aspects of the early algorithmic brush paintings in relationship to earlier painting by hand. 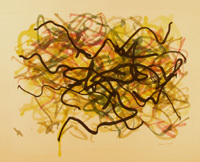 Below: Works painted by hand representing one phase of my work in the 1960's. 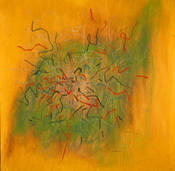 These paintings included use of spontaneous gesture as a means of exploring various states of personal consciousness. 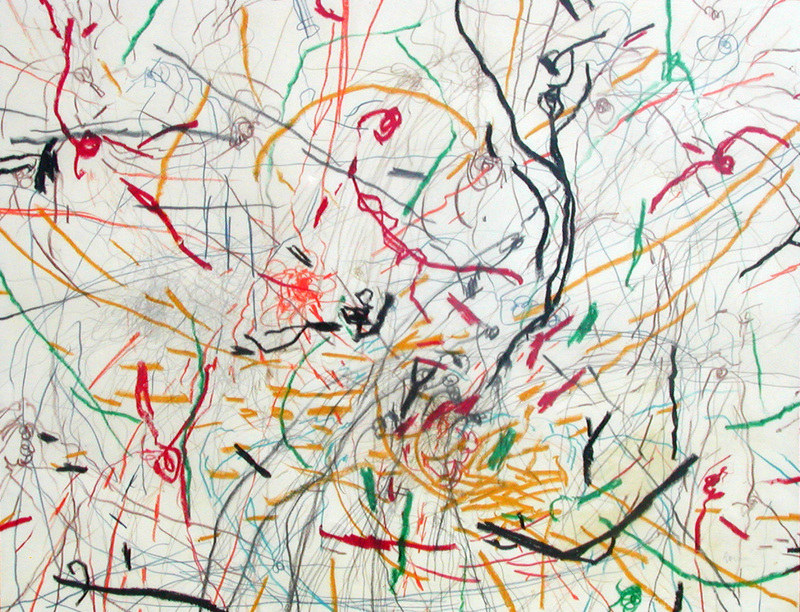 Below: Algorithmic drawings and paintings created with original code. My earliest forage into coded procedures attempted to create a "computer automatism" that would be related to the automatism employed in some earlier work (left column). Untitled, pencil and crayon drawing. Private Collection The Magic Hand of Chance, 1982-85. One frame from an animated sequence shown on an RGB monitor driven by a PC. A coded procedure generates an endless sequence of forms with titles. The sequence includes occasional "Sayings of Omphalos", a form of computer wisdom literature. 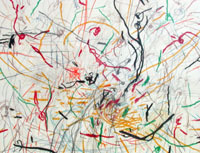 More on the "Magic Hand of Chance"
Pathway Series, 1988, 22" by 30"
Untitled, algorithmic brush painting, 1989, 24” by 40”. Detail, algorithmic pen & ink drawing, 1987, 7" by 10". Click here for complete drawing. Below: Works painted by hand representing another phase of my work in the 1960's. 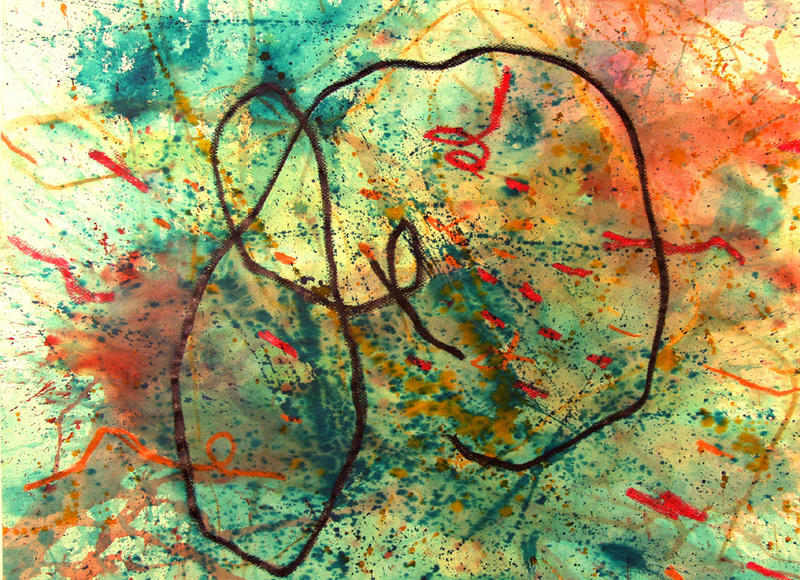 These works placed harmonic geometric elements in a dynamic relationship with non-rational spontaneous markings. Rational control and spontaneous "uncontrol", are juxtaposed in the same visual field. 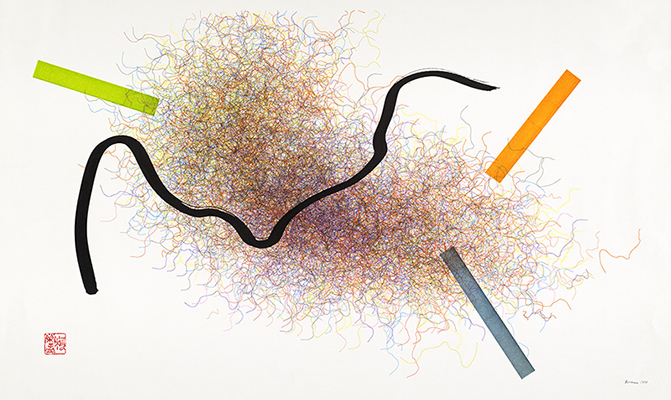 Below: Algorithmic drawings and paintings created with original code. My coded procedures developed into a series of routines that joined random procedures for "computer automatism" with procedures for a controlled placement of geometric elements in the same form field. 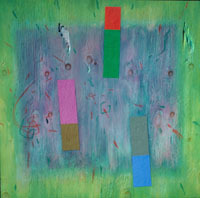 These early works with coded procedures held a close relationship to my earlier work as a painter. Acrylic and crayon on panel with gesso base. 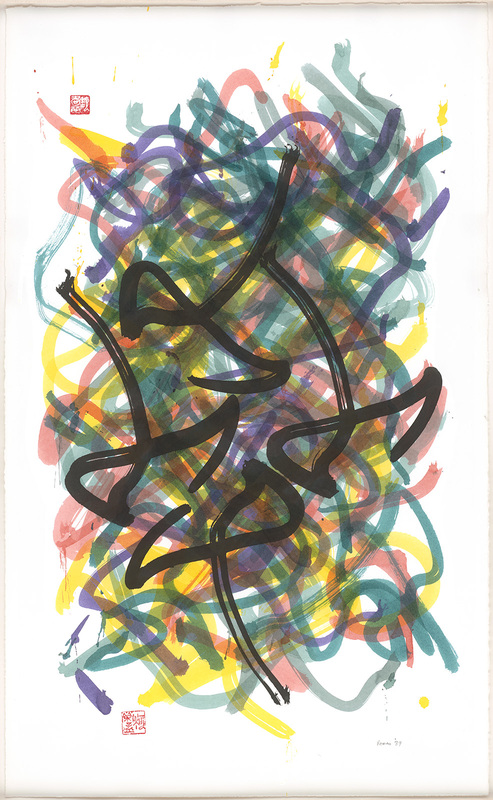 Bird-2, 1/1/1989, Algorithmic pen and ink drawing. 39.5" by 40"
Examples in group (1) above: My first effort with coded procedures attempted to use the operating system of the computer as the form generator. This would be a form of "computer automatism", miming the work of certain late Dada and early surrealist works. I had in mind especially how artists like Hans Arp had experimented with dropping torn shapes of paper on the floor to achieve a composition with "chance" arrangements. Also I recalled the Dada poets play with a procedure they referred to as the "exquisite corpse" (cadavre exquis). Participants wrote words or phrases on slips of paper that were randomly arranged as a poetic expression. My "Magic Hand of Chance" attempted to mime that procedure via algorithms coupled to computing power. I built random-access dictionaries, along with a primitive syntactical procedure for generating titles and bits of automatic writing. The Magic Hand of Chance was shown in the Algorithmic Revolution at the ZKM. The "Magic Hand of Chance" was capable of generating an endless sequence of original visual themes along with original titles and occasional sequences of a kind of computer "wisdom" literature that I labeled as the "Sayings of Omphalos". These sequences were indeed a form of computer automatism, an elementary step towards artificial life and and artificial intelligence. Examples in group (2) above. 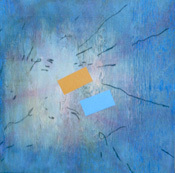 Early on I began integrating other aspects of my earlier paintings in my algorist procedures. The first of these was derived from rational controlled procedures juxtaposed with spontaneous non-controlled procedures. The illustrations in group 2 (above) show obvious examples in both my algorist work and the 1960's paintings of the New City series. On a deeper level one could say that this juxtaposition permeates all my coded work. My algorithms employ random selection within a set of preset parameters. In effect, every coded work emerges from random decisions that are made within controlling parameters ("not less than and not more than"). There are also a few elementary filters that do not allow activity outside of acceptable work areas. Even the cyberflowers that appear so tightly controlled are initiated with a random selection of controlling coordinates. All the overlaps and final forms are the consequence of a randomly generated set of initiating coordinates (random points on a plane). 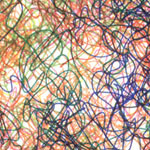 The pen drawn curved lines are then sprung, algorithmically, from these control points. While my code uses a pseudo-randomizer for generating the initial control points this part of the job could be done by casting dice. The organization of lines emerges from tweaking parameters that control angle, scale & position for each line. So these works always embody both random selection and rational control.